On Saturday morning whilst most sane people were still asleep, we found ourselves heading down to the intu Trafford Centre in Manchester for a day of Christmas related fun. I would have enjoyed extra sleeping time, but then I wouldn’t have been able to capture this image… the weather was fabulous on the day and we were truly blessed! 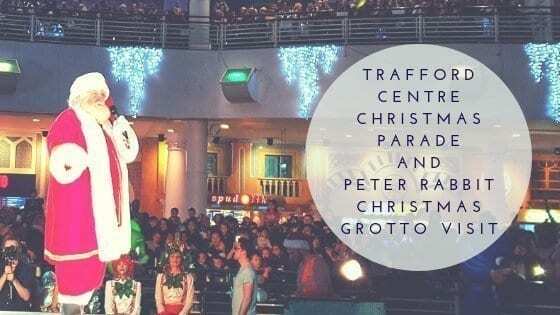 We had been invited along to check out the intu Trafford Centre Christmas Parade, one of the highlights of the year and the most popular event in the shopping centre’s calendar. Packed with many well known children’s TV character’s, the parade promised to be a big draw… and it was! The Trafford Centre was packed and every car park filled, with everyone leaving filled with the joys of Christmas. Before the parade started at 11.30am (there was also a 2.30pm performance), we were fortunate to get the chance to meet the characters who would be appearing in the Trafford Centre Christmas Parade. Liv may be a tad old to watch the particular shows, but she did recognise the characters and clearly I wasn’t shy about having my pictures taken with them! The atmosphere in the Orient was electric as the Trafford Centre Christmas Parade made its way around the top deck before characters made their way onto the stage. Trust me, there is nothing funnier than watching a LEGO Santa and Darth Vader attempt to navigate an escalator! Each character was given time to welcome the crowd before amazing performers and dancers delighted all with songs from The Greatest Showman and Christmas tunes. My favourite segment was Peter Rabbit flossing, possibly the coolest rabbit ever! The Trafford Centre Christmas Parade was absolutely fantastic – a total showstopper and I am so glad we got to attend our first parade at the shopping centre! The finale saw snow shaped confetti being released, much to the delight of many children as they said goodbye to their favourite characters. You can check out all the intu Trafford Centre events in the run up to Christmas and beyond here. Continuing with the Christmas theme, situated just outside the Orient is the very magical Peter Rabbit Christmas Grotto – navigate your way through burrows whilst meeting Peter Rabbit, Mr. Todd and Mrs. Tiggywinkle and be encapsulated by their animal world. The character’s are amazing and hugely funny, offering respite during your wait to see Father Christmas. There are many activities to take part in as you wind your way around the grotto, including decorating your own gingerbread cookie! Which Liv informed me was absolutely delicious! Tickets are priced at £8.50 for children and £5.50 for adults, the grotto runs until 24th December, book your tickets here. Also located directly outside the Orient is the fantastic Alpine Village Trafford Centre experience. Offering traditional Christmas food and drink, alongside family fun activities including a beautifully decorated carousel and big ferris wheel (as seen in the first image). Fortunately, arriving at the Trafford Centre ridiculously early meant we had the opportunity to take pictures before the crowds descended… and descend they did! A fantastic set of Christmas market huts for you to stock up on Bratwurst, Nutella crepes, mulled wine, hot Vimto and even super yummy halloumi fries – which were absolutely delicious and priced at £5 for 5 fries. Alongside the traditional Christmas markets offerings, there is a large tipi tent which houses a bar, lots of comfy seating areas, fire pits, photo booth and live music. The perfect place to chill after a shopping trip at the Trafford Centre! Outside of the large tipi tent is a rather cool igloo seated area for a more chilly themed experience! The Alpine Village is a great addition to the Trafford Centre and offers a very festive Christmas market feel. There really is something for all and children will absolutely love the activities on offer. Check out further details on their Facebook page here. The intu Trafford Centre has surpassed itself by bringing Christmas cheer to all that visit in the run up to Christmas – make sure you head down so you don’t miss out!